....must...continue...to write...at least one...blog post...per month (gasp). Actually, this blog may be approaching its swan song. For a while now, I've been pondering the idea of consolidating my various writings and musical recordings into one website. Kind of a bloggy portfolio homepage thingy, to use the technical term. If that happens, I'll just write my MsFan-like posts there instead. But for now, since this blog is still my main outlet of publishing my writing, I'll keep typing away here and now. It's been some time since I wrote about myself and my own goings on so I'll indulge a bit. As has been the case at this time of year every year since 2011, I'm counting down the days until I touch down in Home Sweet Seattle. And speaking of touchdown, it'll my first time walking the streets of the defending Super Bowl Champion Seahawks :) I can handle the 4:30 sundown and chilly winds; friends and family, soon I'll see you in person! So that's the near future I'm most looking forward to. As far as the two months between my last post and now, life has been pretty good. My parents came for a week and a half in mid-October and we took a trip to Taiwan between their flights in and out of Hong Kong. The weather was perfect for them and I had a great time playing tour guide in areas they missed during their first HK tour two years ago. They even came to my school for an afternoon, which was less painful than I thought it would be. My parents thought that my school was very similar in size and philosophy to my own elementary school on Bainbridge—I guess I've come full circle. The rest of the fall has been busy with assignments for teacher certification (though semester three out of four is finally done) and a never-ending list of tasks relating to my job teaching music. At this moment, most of these tasks revolve around the planning the Winter Concert, where I'll be serving as the coordinator, putting together each grade's individual performance on the greater program. I've been through a fair amount of holiday performances in my life, but never quite in this capacity, so I'm a bit nervous. But as with most things at this school, I feel well-supported by my coworkers. A huge bonus one must not take for granted. Yesterday, I had probably the best Thanksgiving I've had in Hong Kong. Sharman and I went to my ex-coworker Andy and his wife Nicole's village house for an amazing feast outside on their balcony. Outside! And with a sea view to boot. It's not particularly common for people in HK (western or Chinese) to host others for a meal due to the lack of space, so we were, for lack of another word, very thankful to have this experience on Thanksgiving weekend. And today, to make this weekend even more Western-flavored, I'll be going to the Clockenflap music festival to see Tenacious D, the Flaming Lips and a few more. It's the time of year when all the gweilos gather together like white birds of a feather. I've lived in Hong Kong for three years and three months, equal to more than ten percent of my life. At this point, it's quite clearly my second home now. By no means a visitor anymore, I consider myself fairly local. Case and point, I live with my local Hong Kong girlfriend, speak a decent amount of Cantonese, and get impatient after waiting more than ten minutes for my food at a restaurant. And because of all that, I care deeply about the future of this place. Partially because I plan to live here for a few more years at the very least, and partially because I feel a sense of allegiance to the city that has given me so much. Regardless of how long I stay here, I will undoubtedly keep an eye on this metropolis and its fate for the rest of my life. The most common question I get from new acquaintances here is the obvious, "How do you like living in Hong Kong?" My answer varies depending on my mood. On a bad day, "it's so crowded", "too many Mainland Chinese", "too competitive in every aspect of life." On a good day, "it's extraordinarily convenient", "it's the safest big city on Earth", "the hiking and the beaches are incredible", or "it's certainly a great place to be a young, travel-hungry, English-speaking teacher." 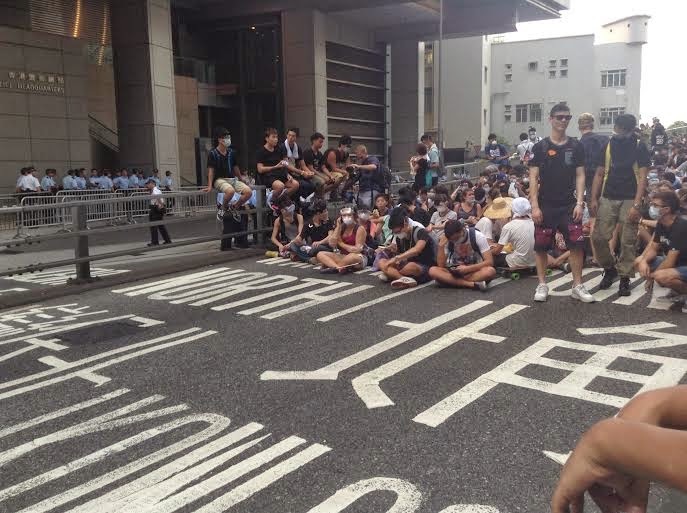 But more than ever before, the Occupy movement has given me a new respect for the spirit of the Hong Kong people. Despite overwhelming odds that the Chinese Central Government would refuse to compromise in any way on their decisions regarding the 2017 elections, the protesters have peacefully held strong. Last night, as I sat at home glued to my computer screen, Chief Executive CY Leung stated that he is sending his Chief Secretary for Administration, Carrie Lam, to meet with the main student group to discuss political reform. It's far too early to say whether this means real change is on the way, but the fact that the government is even opening the dialogue is the first time they've really acknowledged the protesters as more than a nuisance. So in that sense, things are looking up. The way I have been most directly affected by all this is that school has been suspended where I work in the Western and Central District. Monday and Tuesday became preparation days for staff, and on Friday, after the back-to-back public holidays, the school was closed altogether. Essentially, I was given a day off and a dozen extra hours at work to use as I pleased, with no consequence to my pay or future schedule. Needless to say, I have graciously accepted this outcome. However, I also want things to get back to normal soon as I like my job and think that the more time the kids have off, the more they'll forget what they've been learning. But unlike the more common weather-related school cancellations around here, such as typhoon days, it's impossible to project how long this will last. I won't go in to detail about why this protest is so much bigger than any in the past, but to learn more about the complexities of why the protesters are so passionate, I highly recommend this article originally from the LA Times. For me personally, I don't want to live in a place where China's economy is the first priority and all else is secondary. Hong Kong is a thriving, diverse city but at the current rate, it will be a place where only the rich can afford to live comfortably. Along with escalating stresses of supporting a family for the middle aged middle class, getting a job out of university is becoming much more challenging for the youth. And similarly to many income inequality battles being fought in the USA, the minimum wage is not enough to live a human life in this city. For the lower class, if the focus continues to be only on Hong Kong as the cash cow of China and not on assisting those in dire financial need, more and more will fall into the terrifying plight of literally living in cages. Along with that of course, it's about every citizen having a voice. I read a great quote attributed to Beijing economist Wen Kejian from this article in the Washington Post. "The economy of Hong Kong has already been so prosperous and the city has been so open and international that the people of Hong Kong have the wisdom to master their political future." I hope that China can see this isn't a war against them; it is simply a plea for trust. Hong Kongers realize that China is their future and only want the ability to elect a leader who can promise to devotedly serve his/her people, without suspicion of a greater calling in Beijing. For me, chances are that no matter what's decided, it won't affect my life drastically in the near future. As a native English speaker, I have the enormous privilege of being brought up with a highly desired skill that the average Hong Konger my age does not have. 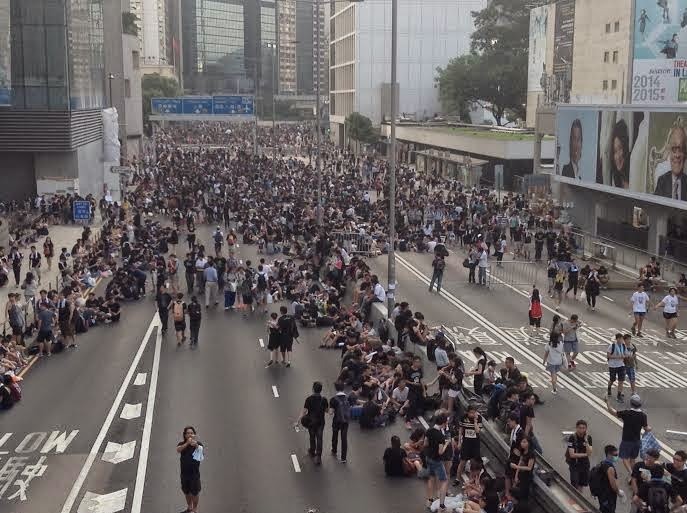 But just because I'm not faced with the same challenges of the youth of Hong Kong, doesn't mean I'm not deeply invested in the events of this protest. This is my home and I want to see the special aspects of Hong Kong remain special and those who live here have all the opportunities of anyone in any developed country. Stay Strong Hong Kong! The last few days have been surreal here in Hong Kong. School has been cancelled for children in the Central and Western District where I work, as public transit in the area has been severely limited by, for lack of a better term, people in the way. So for the last two days, I have been at school with my coworkers, catching up on planning and preparation for lessons. However, it's been hard to go more than a few minutes without checking the news or starting a conversation about the current state of affairs. 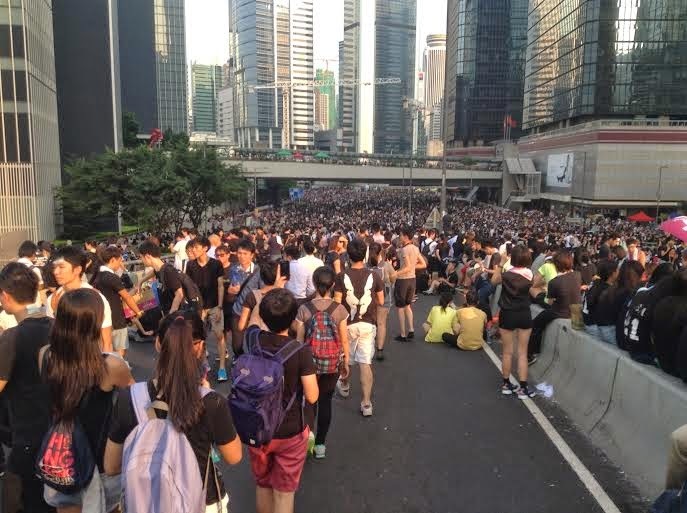 I'll let you read the global news coverage for the details of Occupy Central, but basically, thousands of people are in the streets the financial center of Hong Kong, as well as another dense part of the city called Mong Kok. Several years in the making, Occupy Central is all based around the practice of civil disobedience, a term coined by a great American, Henry David Thoreau. I walked through the occupied streets on Monday afternoon and these were the scenes I saw. As I walked through, it felt calm but buzzing. People were sitting together and casually chatting in one area, but after walking another hundred feet, I spotted and an old man shouting words of encouragement to the mostly student protesters, who responded with cheers and raucous applause. I was offered food, water, a towel and a whole variety of other items by makeshift stalls of items donated by local businesses around the city. This is a fiercely anti-government demonstration but it is just about the opposite of anarchy; everything has been organized to a tee. Hong Kong has a history of protesting the government, even when Britain was in power, but this particular showing is unprecedented. As a resident of this city for over three years, I have never been more proud to live here. The protest is peaceful but powerful; people want democracy with all their heart and soul, but they understand, as Martin Luther King said, "Nonviolence is a powerful and just weapon." Not only am I particularly proud to be a resident of Hong Kong, for the first time in my life, I feel like I am witnessing history happen before my eyes. It's impossible to say what the outcome of this will be as it is likely only in the early stages, but at the very least, Hong Kong people have showed incredible courage and passion to fight for what is right. And they are fighting without harming a fly. For a live feed of the happenings related to the protest, click here. At this moment, I am not at all worried about my or any of my friends' safety. But if things escalate to dangerous levels, I will be sure to send out updates via Facebook and email. Sharman and I returned from Japan one month ago today. I would've preferred to have written this post earlier, while the trip was still very fresh in my mind but unfortunately, life got in the way. Since returning to HK, I've started my new job, commenced my second year of university and have had two friends visit. It's been a good but crazy month and I haven't had time to fully reflect on the highlight of my summer. This trip was my first trip to Japan, though certainly not my last. We were there for two weeks and for much of the time, I was toying with the idea of what it may be like to live there. It's beautiful, varied, filled with friendly people and well...has baseball. Our trip in a nutshell was: Osaka -> Tokyo -> Hakone -> Kanazawa -> Kyoto -> Nara. We covered a triangle outlining Central Honshu, the largest and most populous island of the country. Six places, all with their own personality. Instead of writing a play-by-play of our trip as I've done so many times, I'd like to try to recall the five most glorious moments of the trip. In chronological order. Without a doubt, this was the event I was most excited about before the trip even began. We saw a home game of Japan's worst team, the Tokyo Yakult Swallows, who took on the Hiroshima Carp at Meiji Jingu Stadium. It was similar enough to MLB that it gave me the baseball fix I've been craving for three years, but different enough that I could view it as an ethnobaseballcologist (bear with me on the word invention). The Swallows came away with the victory, at and the end of the game saluted the fans like actors at the end of a performance. This whole day was even better for having a visit with my old college friend Cali, who lives in nearby Chiba. Good times all around! Let's just get the baseball ones out of the way first. This was a museum we almost didn't go to, so I'm very thankful fate twisted our way. I found every room in the museum fascinating. From the history of baseball worldwide, to Japan's achievements in the game, to the Hall class of 2014, to reading through many of the different plaques of enshrined players. One of the players to go in this year was former Mariner Kazuhiro Sasaki, so seeing a player I have fond memories of honored in his country's most prestigious way was quite a treat. We stayed at one fairly nice hotel on our trip for two nights and the hospitality itself ended up being the highlight of our stay in Hakone, partially because we never got a clear view of Mount Fuji. The Hakone area is renowned for it's onsen, which are essentially hot tubs using naturally heated geothermal water. There was something about a delicious shabu shabu dinner wearing Japanese garb, followed by a soak in the onsen that put me in a heavenly state. Super artsy Kanazawa was one of our favorite places and the Kenroku-en garden was the city's main highlight. We went on a day with perfect weather yet somehow, despite its ranking as one of the country's three great gardens, it was not overrun with tourists. In terms of pictures per hour, the three we spent here probably rank tops on the trip. Around every corner was a glorious eye feast of greenery, water and harmonious arrangement. We spent one of our Kyoto afternoons traveling around the Arashiyama district. Here we saw the magical Bamboo Grove, which is stranger and more beautiful than fiction. After that, we walked around what was probably my second favorite garden after Kenroku-en, the Ohkouchi Sanso Garden. Denjiro Okochi was a movie star in early samurai films, who used his riches to design a beautiful Eden-like surrounding for his Kyoto home. Not only was it a gorgeous stroll, the garden provided the best panoramic view we ever had of the city. To end the day, we walked around a lovely riverside park and ate some scrumptious Japanese barbecue. Despite the richness of our two weeks, I felt like I only got a small taste of what the country has to offer. I will return soon, Nippon. For the second year in a row, my July, or at least the first half of it, has been fairly uneventful. In some ways, this is great. You may call it well-deserved relaxation after working hard for the past ten months. On the other hand, I can’t help feeling restless when I’m not busy doing something. Don’t get me wrong, I do not want to go back to work ASAP. But I wish I had the will power to take these few weeks and churn out a masterpiece of some kind. Maybe a sculpture made of cheese? But not to worry, in two days, I’ll be off for a two-week holiday in Japan. Then I certainly won’t be short on things to do. Much like last July, this month has been peppered with private English lessons, mostly for really young children who I met at the kindergarten I left two years ago. Also like last July, and pretty much every month for the last year and a half, there’s been plenty of badminton. Over the last couple weeks, I’ve actually booked a public court several times and met some people for games. This is the nature of Hong Kong; you can never just go to a park for a casual sports game. You need to book in advance! The only games I can get are in the afternoon during office hours, so I’ve been booking those time slots now that I’m free enough to do so. Sharman and I have been in our new flat for two weeks now, and that has taken a bit of time as well. While she’s been working (sucka!) I’ve been home to schedule internet installation, build two DIY wardrobes, de-clutter the office/spare room where I write this now and sort out a quirky electrical problem. Now that everything has more or less been sorted, we’re quite happy and comfortable in our apartment here in Hung Hom. Lastly, as part of my attempt to be more creative, I’m going to posting weekly on my resurrected 'Page 43' blog. There may be anything from a video to a photo to a poem to a drawing to a song to a short story, who knows! Stay tuned. Here are some photos of Big Pink. Inspired by this. It's been a unique week of transitions. I could easily write for hours about the bittersweetness of it all, but I won't, as I'm in an empty flat, and if I don't get out of here soon, I may go bonkers. In a few short days, I'll be able to relax in my new place and write to my heart's content. Something I'm very much looking forward to. This last month, I was sort of the director by default of the school end-of-year performance, as my coworkers knew I had a little background in drama and the part-time music teacher was not available to rehearse on a daily basis. In the end, this last Tuesday, the cute fairy tale mish-mash we did came together quite well. I was so proud of the kids and really felt like we'd achieved something quite entertaining. And the cherry on top was a giant gift basket of nacho ingredients as a token of my coworkers' appreciation for my services. A few of the teaching staff said, "We figured it was better for you than a bouquet." They were absolutely right about this Mexican food fiend. After two years, I ended my job as a primary school teaching assistant. It was my second ever full-time job and the longest yet. As one might expect, I'll desperately miss the kids I worked with for two years as well as my coworkers. Especially the three that are leaving from Hong Kong (all the best David, Katie and Rachael!). After school broke up, my closest coworker friends and I celebrated until late at night, savoring every last minute as part of the same school family. Though I'm clearly bummed that something good has ended, I am confident that my next job is a step up. After two years as an assistant, I now have a teaching post, which is how I hoped it would turn out all along. My two years at the primary school were always kind of like an apprenticeship, and despite the ugly bits with management and various aspects of school policy I disliked, I know I'll look back on this job fondly in the future. I moved into my current Tai Wai flat in March of 2012 and am about 24 hours from officially moving out. The majority of my stuff is already in the new place in Hung Hom, which Sharman and I found two weeks ago. Similarly to the job stuff, I'm sad to go for nostalgia's sake but thrilled for the future. So many things about the new flat are improved from the old one. Overall decor, location in HK, apartment size and living with Sharman, to mention a few. As I said at the start of this, once I'm settled, I'll divulge more details about my new home. There's my end of June. Farewell to this, farewell to that and onwards. I've almost forgotten that I have the next five weeks off from work! Bliss. As I mentioned a couple months ago, soon I will be moving from the Tai Wai area, my home of 2.5 years. This has to do with changing jobs as well as moving in with Sharman! It's all very exciting, but the endless amount of important factors in making this choice can get a bit overwhelming. You'd think that moving from one high-rise apartment to another in the same city wouldn't be a huge deal, but it is. I like to think of writing as a way to help organize a muddled brain, so here it goes. Humor me. Convenience of Location: With my new job on Hong Kong Island and Sharman's in Kowloon Tong, obviously it is ideal for us to reside somewhere in the middle. The distance between the two schools is about six miles, which may seem laughably small, but in Hong Kong, that's a lot. Especially considering that over two million people live in the 18-square mile peninsula that is Kowloon. We've been looking at places that lie along bus/train routes to our respective jobs. And it wouldn't hurt to be able to travel to my university in a direct fashion either. Cost: But with convenience comes extra cost, of course. Here's a handy link I found about living costs in Hong Kong. Scroll down to the bottom and you'll find that an average one bedroom apartment in the city center costs over $2000 USD a month. I find it truly staggering that the rent I paid during my final year of university was less than 20% of that, and my roommates and I were paying one of the highest prices in the area. Sure Washington apples and Mandarin oranges, but still, rental costs in Hong Kong are frighteningly high. When I ask around about certain areas, local friends always say, "Oh that area is quite expensive." I want to say, "Well, duh! Stop being so discouraging." Unless you live off in the boonies where you'd have to commute for hours every day, it's going to be pricey. That being said, I'd love to move to the boonies some day. But for now, I've decided to commit to paying for time saved. My future apartment won't be where that website describes as the city center, but close to it. Comfort of Location: One of the hardest things about leaving Tai Wai, is knowing that I probably won't have the same sort of quiet, natural vibe that I have here. Sure I live in a 25-story cement high rise, but I can still see lots of trees from my window and even hear birds chirping if I wake up at the right time. And to go with that, walking along the Shing Mun River, man-made as it is, is a relaxing, beautiful thing to do on a weekend, with all the mountains and local parks in full display. On the Kowloon side, there are parks and nature but it's limited. There, the priority is on housing an huge amount of people, and keeping them fed and clothed. One of Hong Kong's saving graces is that you're never far from a country trail or a mountain top, but still, my new locale will likely be much more...concrete in style. At the same time, that may mean more interesting cultural discoveries. Shops, music, restaurants, etc. We'll see how those pros and cons balance out. The Apartment Itself: There are many old, old places in Hong Kong and people who look for a bargain by renting out these flats that look like they have hardly been touched since World War II. We're all about saving money, but there's a fine line between a bit older and decrepit. Today, Sharman and I are going to look at some places as there's only so much you can learn from photos on the internet. We don't want to pay a deposit only to find out that the air conditioner is broken and can't be fixed for a week. Again, I'm quite excited about moving but one must carefully navigate the labyrinth of it all. In a month, I expect to be settling in to a new place, and though the physical distance from my current home may be short, the personality of the area will be quite different. Hoping for the best! Thanks for coming to my blog! My name is Ben and I've been working as a teacher in Hong Kong since July 2011. I'm a graduate of Pacific Lutheran University in Tacoma, Washington, USA and thoroughly enjoy sharing my expat experiences and artistic interests with anyone who's curious. Thanks for coming to the site!